Join our team of budding cyclists in the Prudential Ride London – Surrey 100. This is a fantastic event with thousands taking part each year, offering a unique opportunity to become part of cycling history. The route starts in the new Queen Elizabeth Olympic Park, following the closed roads through the capital, then onto Surrey’s stunning country roads and hills before returning to London for a fantastic finish on the Mall. 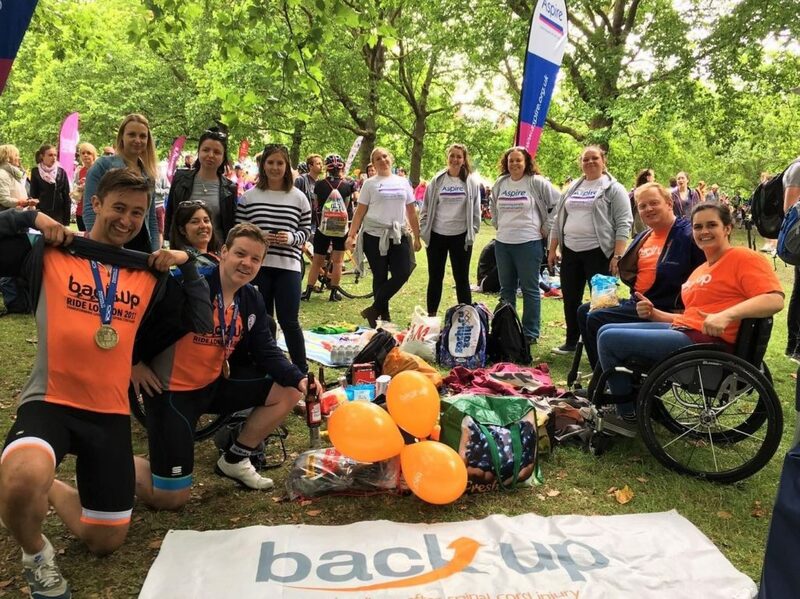 You’ll receive lots of support from our lovely fundraising team with regular updates, hints and tips to help with your preparation and targets. We’ll provide you with a bunch of goodies to help you reach your fundraising goal. You’ll receive one of our brightly coloured Back Up T-shirts/running vests to make sure you stand out. We will be taking photos and videos at the event for use in Back Up’s fundraising and marketing materials. If you want to find out more about how photos and videos will be used, or if you’re attending this challenge and do not wish to be featured, please contact our fundraising team using the details at the bottom of this page. If you would like to take part in this amazing challenge or would like more information, then please give Beth a call on 0208 8875 1805 or send her an email.